Pressure scanner calibrator, the SPC4000 offers a cost-efficient field based solution for the calibration of Scanivalve DSA / ZOC and now MPS series scanners. It can be driven directly from Scanivalve’s PressCal software which can also control a thermal chamber to enable field based calibration. The SPC4000 uses unique removable reference sensors that are the only part of the measurement chain requiring removal to a calibration laboratory delivering higher process availability time for your measurement system. 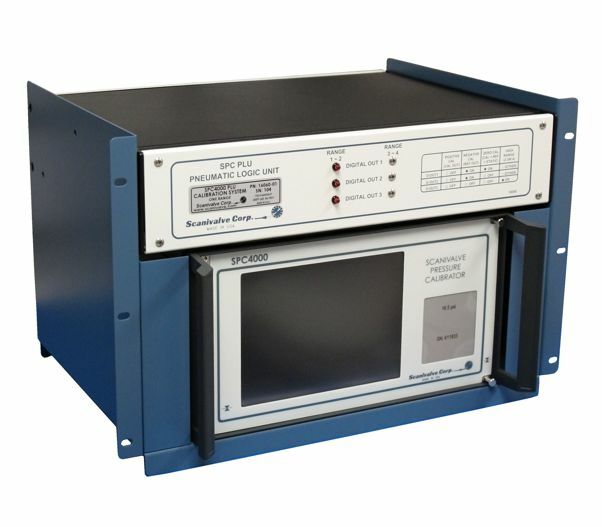 The model SPC4000 pressure scanner calibrator is designed to provide automated calibration of Scanivalve Corp’s DSA and ZOC series pressure scanner. The	calibration system consists of	3 components. 1. The heart of the calibration system is the Scanivalve pressure calibrator, model SPC4000. The SPC4000 calibrator has up to two independent precision pressure regulators. Each regulator can have up to two gauge transducers; thus up to 4 transducers per calibrator. Transducers can be quickly removed for calibration or service. The transducers	are Gauge(psig). Full Scale pressure ranges are available between 0.36psig and 850psig. 2. Scanivalve’s Pneumatic Logic Unit	(SPCPLU)	is required for automated DSA & ZOC calibrations. This unit contains	the pneumatic solenoid valves and manifolds required to perform single or multi-range calibrations, as	well	as zero offset corrections. 3. A utility program, PressCal is included with the SPC4000. It performs automated or manual calibrations on all	DSA	and	ZOC	pressure	scanners	by controlling the pressure calibrator and SPCPLU. The PressCal program is hosted in a Windows XP®	environment. PressCal updates the module	calibration coefficient files and generates “as received” and calibration validation	reports.